I admit that I kind of skip over the fall decorating and crafts, which is really a pity because fall is the most amazing season ever. I can’t even express to you how much I love it. And after living in Arizona for the last four years, this fall season means more to me than ever. The trees are changing color in the mountains but not yet in the valley where we live. 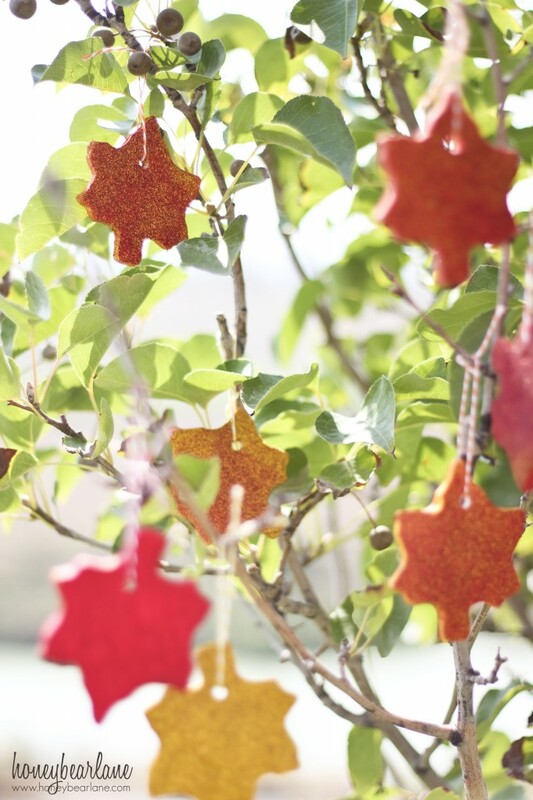 So I thought I’d bring a little faux color to the trees with some salt dough leaves! 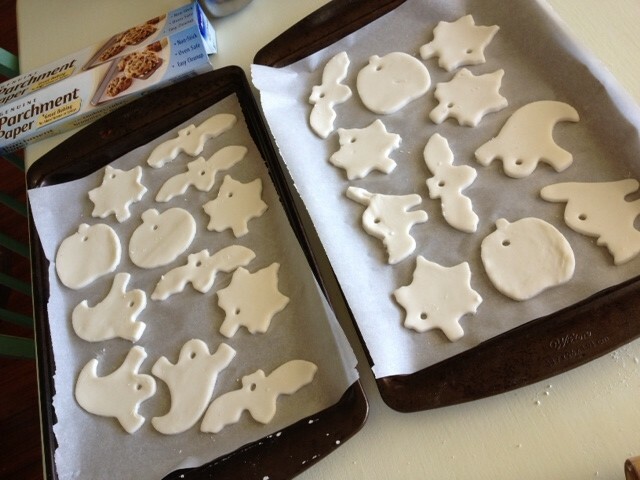 Just follow this easy salt dough recipe and you can create these beauties yourself. Aren’t they pretty? They were so fun to make too because I did them with Will, my 4-year-old. This is a great kid’s craft! 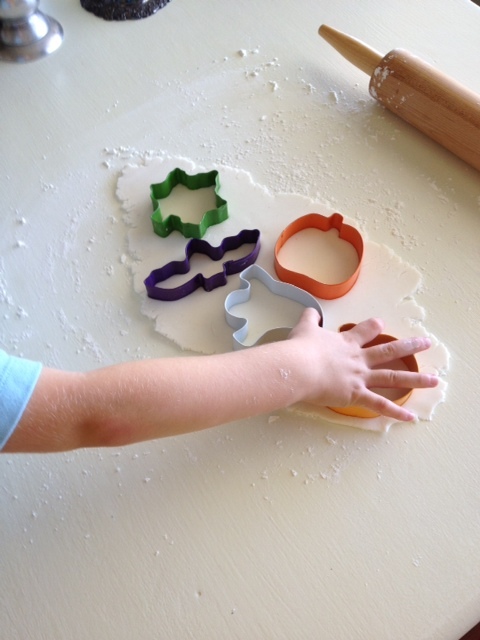 We made the dough, cutout the shapes, baked them, painted them, and glittered them together. 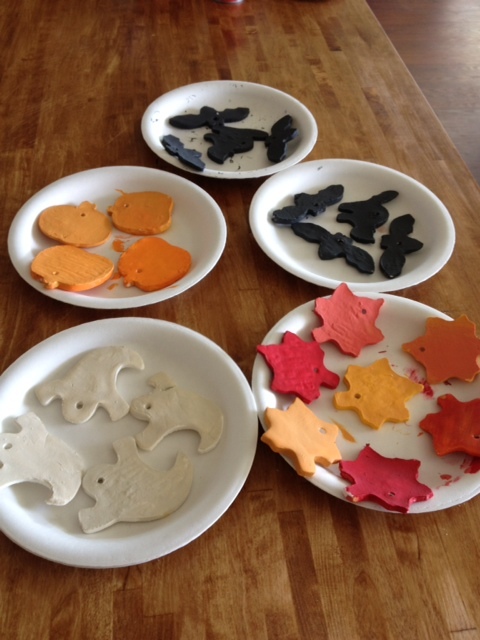 Follow me after the jump to see how you can make them! Heat all ingredients in a saucepan and stir until the consistency is right--like playdough. Then dump it out and knead it. It turned out very well and was very easy. 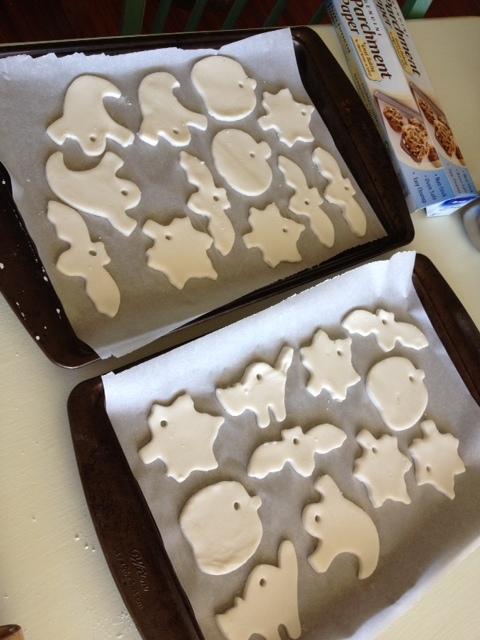 Then we rolled it out and used cookie cutters to cut some shapes, each about 1/4″ thick. We did some other shapes too for another project. To poke a hole, we used a straw. We placed each shape on parchment paper on a cookie sheet and baked them for an hour at 175 degrees, flipping over halfway through. 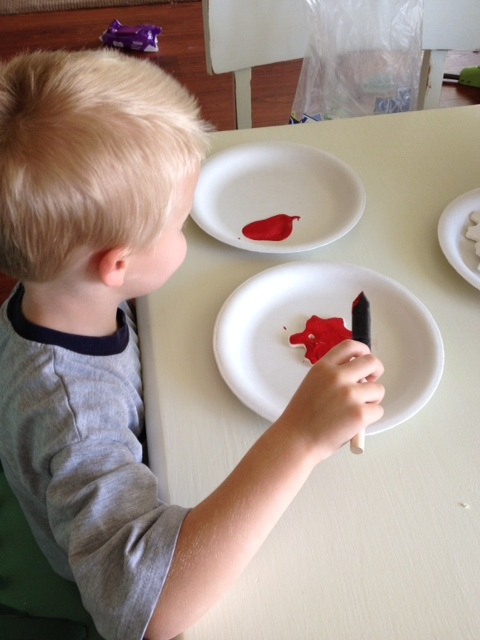 After they had cooled completely, we painted them with acrylic paint. To make the colors mix a little to look like fall leaves changing color, I would paint it one color and then dip my brush in water and dip it in another color. Then I’d paint another color on top and the water would make it blend in. We painted both sides and the edges. After they dried, we sprayed some adhesive on one side and them glittered it, mixing glitter colors to make them blend again. For tips on glittering, refer to my Glitter-Striped Candle post. To seal the glitter, I sprayed with polycrylic. When it was dry, I threaded some baker’s twine through the hole and tied a knot. This was kind of a time-intensive project but I think it was worth it! 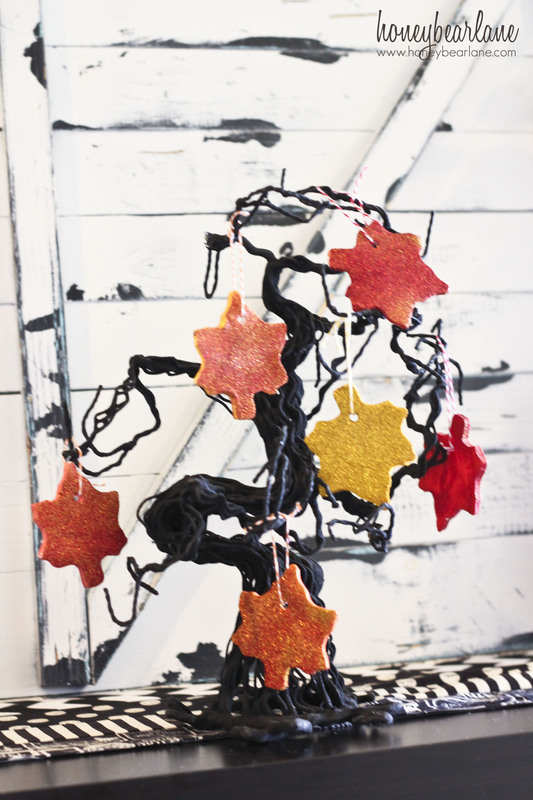 Now we will have these little ornaments for years to come and they can be used in so many ways to decorate for fall. I used them on this spooky tree too. I used to make these with my little ones. 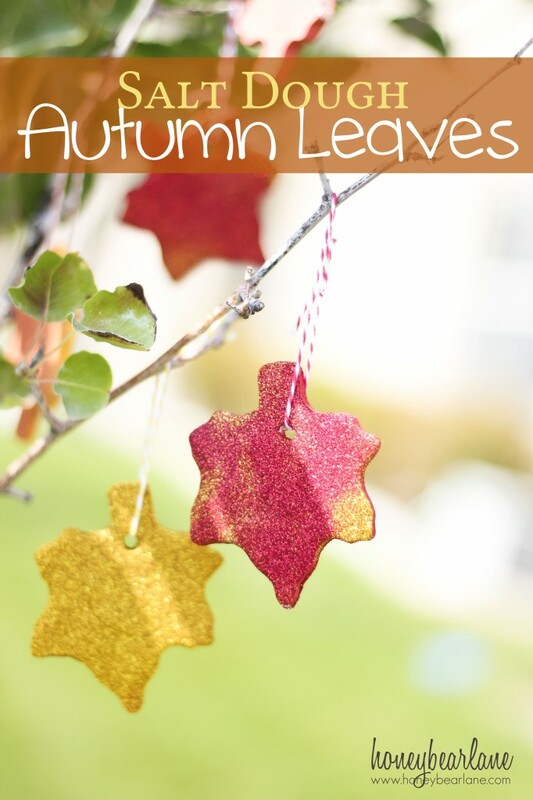 Such a cute idea and I love the addition of glitter! I’d also love to know what the recipe is please. Hello, I edited it to include the recipe now.